There are two photographs here showing 29 High Street. In the photograph above, 29 High Street is the smallest building, just right of the centre of the photograph. It was then part of Councell’s grocery store. The photograph on the right below (taken in the 1960s) shows 29 High Street was then part of the Coop Grocery Store. Note you can just see the edge of the Westminster Bank on the extreme right of this photo. The Crown – an indenture dated 26th July 1732 shows that the Feoffees of the Free School of Thornbury let the property to Thomas Cox and his wife, Mary. Thomas was an innholder and the property was described as being ‘all that messuage or tenement or inn with the appurts situate lying and being in the Burrough of Thornbury commonly called or known by the name or sign of the Crown being part or parcel of the demesne lands belonging to the said Free School of Thornbury and are now in the possession of the said Thomas Cox as tenant‘. Note – this Crown should not be confused with the pub also of that name which operated in the late period of the 1700’s and was situated at 25 High Street. We are fairly confident that both properties were called the Crown at different time because they are based on reliable sources. Number 29 belonged to the Feoffees of the Free School who were said to be the owners in the 1732 indenture mentioned above and Thomas Cox, the tenant in 1732 is listed in the Feoffees Accounts. The other property, 25 High Street, was associated with the Hylpe Charity and the Mayors Accounts list the owners and mention the Crown. Subsequent records in the Feoffees Accounts up to 1741 show that Thomas Cox was paying £4 per annum in rent. (Note in the 1737 accounts there is a note against the £4 entry showing that £5 10s was being paid in 1767). The accounts shows that Thomas was then replaced by Benjamin Pierce (or Pearce) in 1742. We do not have the accounts records between 1742 and 1753 although there is a reference to Benjamin in the records of the Grammar School under the date 15th January 1749/8, ‘upon payment of Benjamin Pearce (one of the school tenants) to Mr. Edward Parnall of £4.9.0, I do revoke all claim, right, title or interest to the grammar school of Thornbury, as witness my hand, Richard Jones’. We assume that this Benjamin Pierce was the father of the Benjamin Pierce (born on 18th November 1741) who later lived at 31 High Street. In this case, Benjamin senior’s wife was called Hannah. The Lamb – the Feoffees accounts show that in 1754 John Longman was shown as the tenant paying £5 per annum in rent ‘for the Lamb’. He is shown in the accounts up to 1757. The list of victuallers drawn up on 18th September 1755 shows all the retailers of alcohol in Thornbury at that time. It says that the victualler at the Lamb was John Longman. A document held by Gloucester Records Office (D866/T8) is an indenture dated 24th December 1759 between the Feoffees and Edward Thurston, a tallow chandler. It shows that Edward was being let for 14 years: ‘all that messuage or tenement called or known by the name or sign of the Lamb now in the occupation of John Longman‘. The rent was set at £5 10s. We should point that there was another pub called The Lamb which was situated at the lower end of Castle Street near the Church. The last will and testament of Kingsmill Grove written in 1811 refers to a property called The Lamb which stood on property which Kingsmill had bought from John Salmon. Kingsmill had taken down and removed the Lamb and replaced it with a house called ‘Thornbury House’. We believe this other Lamb is likely to have traded at some time between 1775 (as the indenture relating to Kingsmill’s purchase from John Salmon at that time makes no mention of it being the Lamb or any pub) and 1790 or even later (when we know Kingsmill was living in Bristol). The Collings family – the account books in 1806 show that the house, premises and garden previously let by the Feoffees to Edward Thurston was next to be let to Samuel Collings, a clockmaker. There appears to have been a large increase in the rent to £14 per annum for which we can find no explanation. The account book notes that the rent includes the fixtures ‘grate and duch (sic) tiles in best room upstairs and grate hobbs duch (sic) tiles and iron fender in kitching’. By 1826 Samuel’s rent had been reduced to £12 per annum. We believe that this means that Alfred had such a smart new window that he would win a prize if it were put into a competition. Alfred was a clockmaker like his father, Samuel. The accounts for 1879 show rent was then at £18 per annum. Alfred continued living there with his wife, Sarah until his death in 1882. The 1883 accounts show Mrs Collings was paying the £18 per annum rent. By 1885 property sold off. We don’t know what happened to Sarah. William Henry died in 1887, but his family carried on with the shop. It continued trading under the name of Councell & Sons until 1946. On 16th January 1946 the property and the business was sold, initially to Frederick William Davies, a commercial clerk from Cooper Road, Westbury on Trym. On 31st January 1946 he sold it on to the Bristol Co-operative Society. 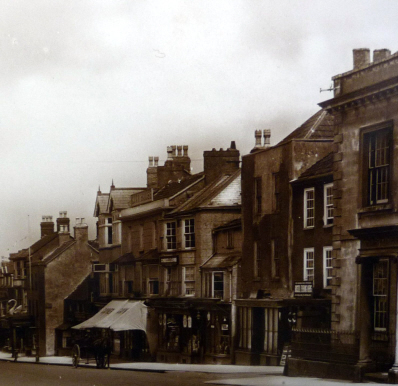 ‘The Co-op’ – it carried on trading out of the buildings acquired from the Councell family in 1946 and bought two other properties, 23 and 25 High Street, acquired in 1954 from the Gayner family. It incorporated 25 High Street and part of 23 High Street into their premises. The other part of 23 High Street was let out to other tenants. We understand that 29 High Street was left empty for some years until the Co-op opened it as a shoe shop under the management of Norman Dunster. On 31st March 1971 these properties were sold to Thornbury Rural District Council for the re-development of the shopping centre. They demolished the buildings and created St Mary Arcade, a ‘pedestrianised’ row of shops running between the High Street and St Mary Street. They paid the Co-op £36,000 for the four properties. Number 29 was the first shop to be demolished. As shown in the adjoining photo, a new shop was built on the site of 29 High Street before the other shops were demolished. Click on the thumbnail to see a larger image. This shop was let to Forbouys, a newsagents.